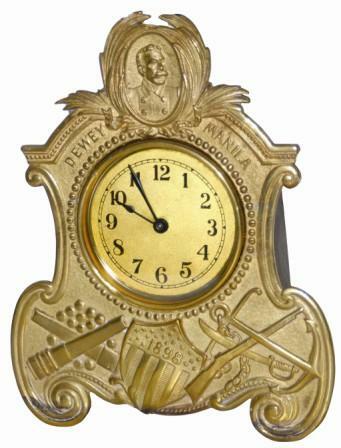 Rare novelty clock, "Dewey - Manila - 1898", all signed on the front of this cast brass case. It stands 10" high, in good clean condition, little if any wear. Also cast onto the case is a bust of Dewey at the top and cannons, cannon balls, rifle, sword, and anchor, at the bottom. Excellent dial, hands, and tin can movement. The clock is time only, winds and sets on the back. I suspect it is an 8 day movement.